There is hardly anything Rebekah Sangeetha Dorai cannot do. But this honest exploration is trapped within its own meta-theatrical devices. 7 July 2018, 7.30 p.m. In my review of Actor, Forty by The Necessary Stage, a monologue performed by Yeo Yann Yann, I noted two things. First, it is “the show is Yeo’s performance CV”. Second, it is “shot through with meta-theatricality”. Building a Character, performed by Rebekah Sangeetha Dorai, certainly rivals this. 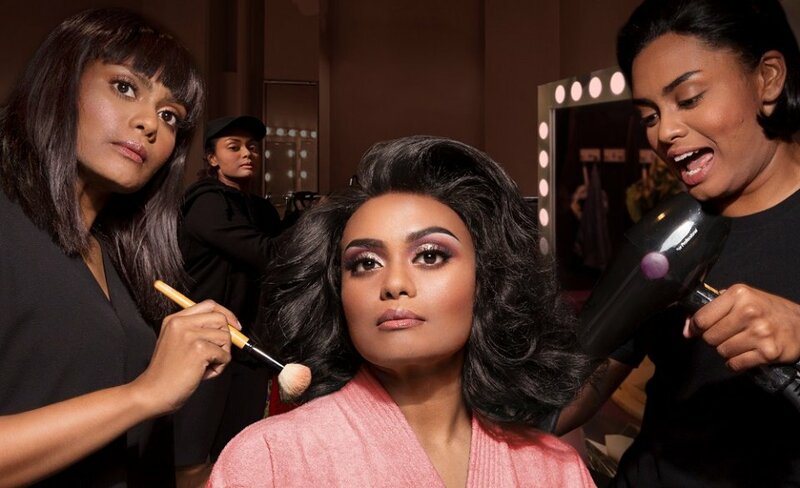 The show is an honest look into Rebekah’s life, highlights of her career as an actor, and the struggles that she faces as an Indian actor in Singapore. To prove her point about the last issue, Rebekah regales a portion of the countless insensitive incidents she faced. These include being asked to act “more Indian” in auditions, or people wondering why she was there in the first place; the paucity of roles in casting calls; and the general lack of representation in the media. In the course of doing so, she mimics various people she encounters and creates a spectrum of “Indian-ness”—from the slight accent to a full-blown head-shaking, hand-twisting caricature. Apart from revealing the biases within the entertainment industry, she displays an immense versatility that is rarely seen. A parallel occurs in her personal life as we hear anecdotes about being called San-San by her teacher, as said educator did not bother to clarify the pronunciation of Sangeetha; or being told to close her legs. Again, we see more of Rebekah’s skills and versatility, so much so that she could simply make an outstanding acting reel by stringing together 10-second snippets of every scene in the show. But what makes this one-hander not fall into a trap of being a woe-is-me exhibition of self-flagellation? To the credit of playwright Ruth Tang and director Teo Mei Ann, it all starts with a little self-awareness. In the programme notes, Tang explained that she was wary of simply going for “emotional catharsis”. Instead, the show from the fact that Rebekah is an actor and used the characters that Rebekah played as entry points into her life. Rather than forcing us to sympathise with Rebekah, we are invited to see how the she relates to the character, and to draw wider resonances for ourselves. Perhaps, what is most refreshing is Rebekah interrogating the ethics of being in a show about her life that is written and directed by someone else. We see her talking about the script or even staging choices, as in one scene, we see her mumbling, forcing us to read the text on the screen. Such a dynamic compels one to consider not just her particular situation or story, but the difficulty of playing out our lives with aspects that are not within our control. The meta-theatricality of the show also extends to the choice of having various gadgets such as voice-distorting microphones, mixers, and lamps, as we see Rebekah constantly play out the various situations she faces. The show is enhanced by her ability to gauge the audience in the room and immediately lighten up the atmosphere or bring the room to a sudden hush based on the topic at hand. That said, the cleverness of the show is also its weakness. Certain parts of the show are merely riffs of a theme of building a character, which does not add anything to the discourse. For example, after a somewhat long monologue on being asked to be “more Indian”, we suddenly see Rebekah reappearing on stage as a wild rock star, lip-syncing to a song, only for the section to be cut short by a voiceover—also done by Rebekah—asking her to be more Indian. Additionally, certain transitions consist of her dropping the topic and moving on. Given her sheer facility in picking up and dropping her characters so rapidly, I start to wonder if the anecdotes presented actually happened to her, or that they happened to someone else, but the creative team decided that it was important to present it on stage. Furthermore, certain choices are a little gimmicky such as the decision to sprinkle confetti at the very end, when she came to a realisation about her abusive father. While I understand that there was a very conscious decision not to reveal every single detail about a sensitive issue, it dilutes the gravity and poignancy of the situation. With such an irresistible character presented, let us hope that she builds a more illustrious career after this. 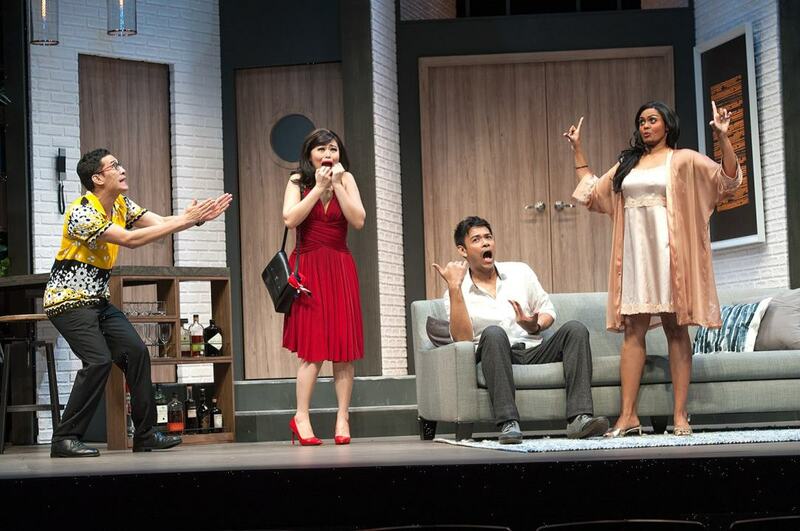 “Singapore Theatre Festival: Building A Character shines spotlight on race issues” by Akshita Nanda, The Straits Times Life! 25 June 2017, 3 p.m. There are plays which are re-staged because it is canonical, and every re-interpretation is an opportunity to disclose certain aspects of the show. And there are others which are re-staged because they are popular. Boeing Boeing is the latter. However, director Pam Oei must be commended for not merely turning it into a tent-pole production that the company trots out every few years. Glen Goei, Oei’s directorial predecessor, has paved the way by re-contextualising Marc Camoletti’s old-fashioned plot—of an architect maintaining affairs with three air stewardesses based on his faith in airline schedules, and the loyalty of his maid, and friend from university—for Singaporean audiences. Oei, having performed in Goei’s staging, makes her mark by pushing her actors to showcase the hallmarks of a farce, and what makes the show such a delicious guilty pleasure. For starters, she literally pushes the actors closer to the edge by approving Eucien Chia’s set design. Chia takes the intimate space of Victoria Theatre, and makes it even smaller by having the set farther down-stage. With numerous doors fanning out towards the audience, one is pulled into the action. One wonders which one would open, and secretly hopes that it does at an inopportune moment just to see how Bernard, the architect, weasels his way out of the situation. The smaller playing space also makes it more difficult to distract one stewardess, while shooing another one out. Additionally, Chia’s industrial aesthetic, which is softened by an earthy palette of the furniture and doors, is an urbane and clever complement to the colourful carousel of amorous dalliances that takes place in the show. While Oei, as director, no longer needs to wear a form-fitting uniform for the show, she does not loosen the corset on the performative elements. After taxiïng to the runway with the introduction of Jeanette (Oon Shu An) from Singapore Airlines (SIA), and Bernard (Rodney Oliveiro) boasting to Roger (Shane Mardjuki), his university friend, about his smooth operation, the show takes on the speed of a Concorde. The breakneck speed of the physical antics, executed so flawlessly by every single actor, is no mean feat. Rarely are we treated to such a well-coördinated comedy at an early stage of the run. 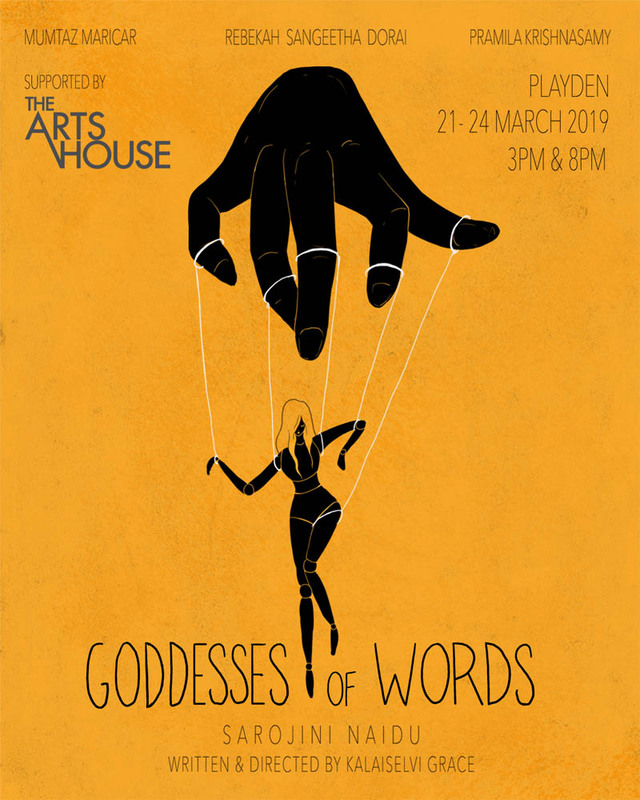 Jeanette (Oon Shu An), the materialistic Miss SIA; Jayanthi (Rebekah Sangeetha Dorai), the strong-willed but down-to-earth Miss Air India; and Jin Jin (Judee Tan), the patriotic but mawkishly romantic Miss Air China induce raucous laughter by playing their stereotypes to the hilt. Even though naturalism is not expected in a farce, the women endear themselves to the audience in the brief moments when snatches of their personality peek through the stereotypes. Kudos to the three actors who seamlessly juggle both aspects wonderfully. The intensity of Shane Mardjuki’s Roger peaks too early, but he manages to maintain it without spiralling out of control. Despite being in awe of Bernard’s international harem, the boy from Kuching proves more adept at keeping up the charade, while pursuing his own interests. Bibeth Orteza, as the beleaguered maid Rosa, brings much mirth as she punctuates the show by exclaiming, “It’s not easy!” While it is overused, Orteza’s energy and keen sense of timing provides a welcomed break from the flurry of activities among the other characters. Despite nailing the physical aspects of the show, Rodney Olivero does not add much to the paper-thin character of Bernard. When Roger tries to hint to him that his plans have gone awry, his incomprehension is one-note which stifles the comic potential of the scene. Furthermore, the rapidity of the scenes sometimes proves too much for Olivero as he accidentally calls Jayanthi, Jin Jin at one point. Unfortunately, his scene partners decide to ignore it and forgo an opportunity for improvisation. In the programme notes, Oei mentions that she wants to offer her audience a “respite from the cares and confusion of the world.” Therein lies the key to the show’s success—working hard to have that light touch. While there are many limitations to the conventions of farce, this iteration of Boeing Boeing ensures that one does not dismiss it right off the bat. “Theatre review: Shane Mardjuki shines in fourth staging of Boeing Boeing” by Cheong Suk-Wai, The Straits Times Life!